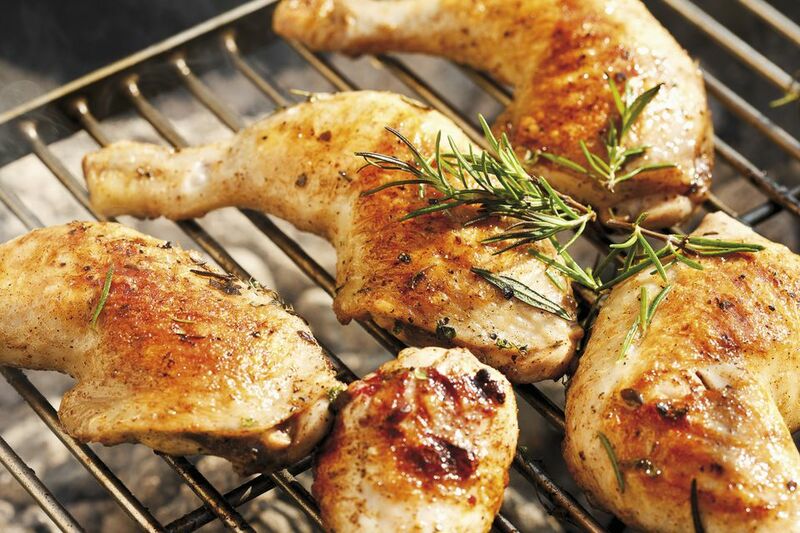 Grilling chicken is a healthy option to frying though both taste delicious. In this Classic French Rosemary Baked Chicken Recipe you have the option to try either way. Marinating budget-friendly chicken pieces in herb-laced lemon juice, white wine, and oil allows this succulent rosemary chicken recipe to stay juicy through the cooking process. Serve the cooked chicken with simple grilled or baked potatoes, a fresh chopped salad, and a plate of fruit turn this into a complete, wholesome and somewhat healthy meal. To make the Classic French Rosemary Baked Chicken Recipe start by stirring together the olive oil, the lemon juice, lemon zest, white wine, rosemary, garlic, salt, and pepper until all the ingredients are thoroughly combined. Place your chicken pieces into a large baking dish and pour over the oil and lemon marinade. Turn the chicken pieces at least once to coat each piece with the marinade. Cover the dish and refrigerate the chicken for a minimum of at least 1 hour (longer if you have the time), turning the pieces once every 15 minutes if you can or as frequently as possible. Preheat a grill or brush a large skillet with oil and set it over medium-high heat. Arrange all the chicken pieces on the grill or place the chicken, in batches, into the hot skillet. Discard the marinade. Cook the chicken for 4 to 6 minutes on each side whichever way you choose. The chicken is done when the thickest part feels firm to the touch and tests 165F on an instant-read thermometer. Serve hot as an entree or allow the chicken to go cold then refrigerate and serve later sliced in a salad or on a sandwich. Garnish with additional fresh rosemary, if desired. The recipe above is a classic and as such is best not messed around with too much. However, you can ring the changes by just adjusting the type of herbs you use. Thyme or sage are delicious alternatives, or for a truly summery flavor to the dish use a good handful of fresh basil in the marinade. This rosemary chicken recipe makes six servings.